At any age, physical health has a strong impact on mental health. In later life, this association is even stronger because older adults typically have several chronic health conditions that can affect physical as well as mental health. In this five (5) part series, you will review the signs and symptoms of common conditions that may occur for some older adults. You will also learn how to manage some of these illnesses. Included is information on ways to communicate with physicians and other healthcare providers to build a partnership with you and your family member. Finally, you will learn ways to store and manage medications and to encourage older adults to take their medications. Your family member is experiencing a number of changes in how they see and hear as a result of aging. Some changes are a normal part of aging, although they may require a professional’s attention if they cause safety problems or interfere with your family member’s ability to enjoy life. Vision and hearing problems are quite common. Vision – Several changes in vision frequently occur with aging. For example, depth perception is decreased, which can cause people to stumble or fall because they can’t judge how high a step might be. It is important to help them take special care in unfamiliar surroundings. An older person’s eyes are also slower to adapt to changes in light, which may cause problems with night driving or go from light to dark places. Take extra care with different light conditions such as going in or out of sunlight or from room to room. Older people who drive may need to limit their driving to daylight hours. Farsightedness, that is, the inability to see objects close by, may interfere with reading, needlework, or other activities. This can often be corrected with glasses. And, difficulties in distinguishing the colors blue and green can cause problems when taking pills. Make sure that color isn’t the only way that pills can be distinguished. 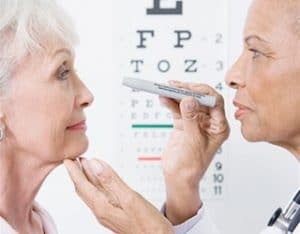 If you suspect any of these changes, you may wish to get an eye examination for your family member every three to five years more often if necessary. Not only will this help ensure that they have proper eyeglasses, but it will also provide a way to detect any serious eye diseases or conditions, such as glaucoma or cataracts. Paying careful attention to vision can reduce the risk of falls and medication errors and generally provide for a better quality of life. Hearing – Although many people maintain good hearing throughout their lives, hearing changes often occur when people grow older. It is important to notice changes in hearing that can cause problems, and take steps to adapt to these losses. One common change is the loss of high frequencies and the sounds of certain letter combinations like “ch” and “sh”. Check to see if your family member hears male voices (which are lower frequency) better than female or children’s voices (which are higher frequency). Sometimes people feel that their older family members are ignoring them when they simply cannot hear the person’s voice. A hearing aid might help. Some people have difficulty locating the directions of sounds. If so, they should take special care when crossing the street. Sometimes a sudden loss or reduction in hearing is simply caused by a build-up of earwax. Have this checked and cleaned as needed. If hearing loss has occurred, there are some things you can do to help your family member adapt. You can face each other when you talk, so you can see each other; watch for facial expressions that might indicate a lack of understanding; speak as clearly as possible; keep questions short and simple; and eliminate other noises, such as TV or radio, when you are talking. If your family member has difficulty hearing, it can interfere with the enjoyment of daily activities. A loss of hearing might contribute to a feeling that others are hiding things from them or trying to deceive them. This can be quite frightening for them and be frustrating for you. If you suspect vision or hearing loss, it is wise to check with a professional. For more information visit www.medicationcallreminder.com.